A noticeable trend in the market for neurology devices is the emphasis on developing superior neuromodulation and neurostimulation techniques leveraging minimally invasive procedures that benefit the patients. To accomplish it, deep pocketed players are seen pouring money into cutting-edge research and development. Savvy companies are also seen collaborating with universities and other institutes for the sake of better research. Some of the prominent players in the global market for neurology devices that have furthered their positions through continued thrust on product development are B. BraunMelsungen AG, Covidien PLC, W.L. Gore & Associates Inc., Johnson & Johnson, Stryker Corp., Medtronic Inc., Integra LifeSciences Holdings Corp., St. Jude Medical Inc., and Magstim Co Ltd. These companies are also always on the lookout for profitable mergers with smaller companies and research institutes to grow further in the market. A recent report on the market for neurology devices published by Transparency Market Research finds that it would attain a value of US$13.6 billion in 2019 by rising at an impressive pace. 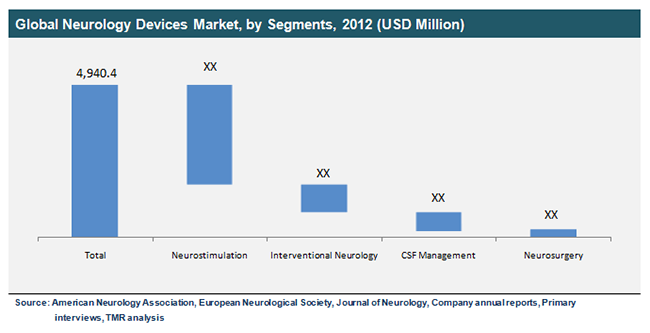 Neurological devices available in the market can be classified into interventional neurology devices, CSF management devices, neurosurgical devices, and neurostimulation devices. Among them, the neurostimulation devices are raking up maximum revenue owing to the increasing population of the elderly, particularly in the developed regions of the world, rising instances of obesity and depression, increasing spends on healthcare, and most importantly emergence of more sophisticated devices. Geographically, North America is a leading region because of the supportive government initiatives in the domain of pharmaceutical research and development, a state-of-the-art healthcare infrastructure, and a relatively large number of CNS disorder patients. Mainly fuelling growth in the global market for neurology devices is the increasing instance of cerebral stroke and other acute disorders, namely epilepsy, Alzheimer’s disease, and Parkinson. As per National Institute of Neurological Disorders and Stroke (NINDS), around 50 million people in the U.S. are afflicted by such disorders resulting high expenses incurred in therapy. This also costs the economy as it leads to loss in productivity. On the downside, however, the market for neurological devices is running into headwinds owing to the steep cost of the products. This has egged original equipment manufacturers to rollout more affordable devices for treating neurological disorders. The market is also being crimped owing to the ineffective reimbursement policies and difficult taxation rules, especially in Europe and the U.S. However, progress in the domain of imaging technologies and subsequent development of neurosurgical endoscopy devices are likely to drive growth over the forecast period.